What in the world is Smart Air doing? How Safe is Indoor Air? Friend: I’m not sure if I can make badminton tomorrow. I have a basketball game in the day. Me: Oh man, do you play outside? Friend: Wait, why do you say that? Me: Oh, the air is way worse outside. I used to feel like I had asthma after playing basketball outside. Friend: Really? No, they’re not that much different. I saw it’s just 20% different. Seeing as how nerds cannot let matters of fact go, I started using my particle counter to take measurements of inside and outside air at different locations around Beijing. This answer is important: it tells you if it’s any safer to exercise indoors and how much damage you’re doing to your lungs by choosing that seat outdoors at your favorite cafe or restaurant. On average, indoor air had only 36% of the pollution outdoors. 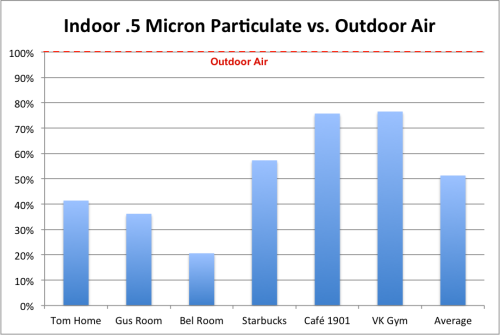 On average, indoor air had only 51% of the .5 micron particulates of outside air. My guess is that the .5 micron data was worse than 2.5 micron data because it’s easier for smaller particles to get into your home and stay suspended in the air. There is a lot of variation between places. For the 2.5 micron particles, the locations varied from 14% to 58%. Dr. Saint Cyr also found significant variation between two apartments he lived in, 50% to 70%. In terms of particulate pollution, you’re safer snagging an indoor seat and working out indoors, particularly on bad days (I’ve seen some argue that we are particularly vulnerable when we work out because we breathe more deeply than normal). But remember that doesn’t mean indoor air is safe, just better than outside. For example, if your air at home had 40% of Beijing’s concentration last night at 11pm (8/15), you would’ve had 64 g/m3 in your home, which is more than twice the WHO standard of 25. As usual, I’m posting more on my methods and raw data below. Here are the raw counts indoors and outdoors, as well as the dates and approximate locations. Remember that my particle counter gives the number of particles per .01 square foot in two sizes: (1) 2.5 microns and above and (2) .5 microns and above. These are NOT the exact same as AQI. AQI uses measurements of weight. My machine gives the number of particles. They’re highly correlated, but not identical (correlation here, at bottom). Measurements from outside are taken from my particle counter. In most cases, it was not convenient for me to take measurements outside the location, so I took measurements outside my home. My particle counter needs to be plugged in, so taking measurements outside Starbucks would mean I’d have to bring an extension cord and run it through the cafe to the outside. However, that variation is not usually very big. 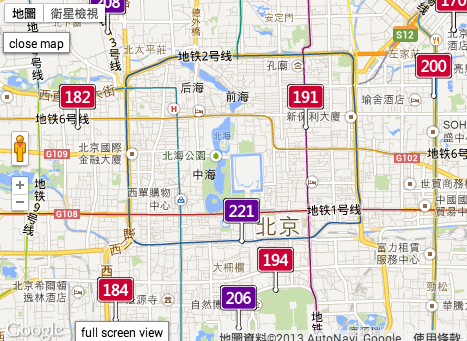 For example, a difference between the 191 near my home and the 200 near the Starbucks I visited is negligible. I think it’s safe to assume that measurements outside my home are similar to those in other parts of town. In two cases, I was able to get a measurement directly outside of the indoor area: my house (Tom home) and the VK gym. I also avoided days where there were sharp drops or rises in air quality because four of my indoor and outdoor measurements were not taken at the exact same time (i.e., I took a measurement at home and then biked to the second location to take measurements). Finally, these results are for places that do NOT allow smoking (although I did take measurements at smoking places too–more on that later). Thomas is an Associate Professor of Behavior Science at the University of Chicago Booth School of Business and the founder of Smart Air, a social enterprise to help people in China breathe clean air without shelling out thousands of dollars for expensive purifiers. Shanghai Test: Is indoor air better than outdoor air? India Test: Is Indoor Air Just as Polluted as Outdoor Air? Why not using the automatic 24h/7days non-stop particle counter ? Too expensive ? great post! can you add a share button on this site? really wanna share it with my family and friends via Facebook and wechat moment!! Thanks for the suggestion! We should add that. I’ll ask the team. Hey Hugo! We’ve added share buttons to the blog – thanks for the idea! Q&A: Do ACs bring in more dirty air? Smart Air is a social enterprise with bases in China, India, Mongolia and the Philippines that creates simple, no-nonsense air purifiers and provides free education to help people fight the impacts of air pollution. Smart Air isn't like your average company. Our goal isn't big bucks, but helping spread the word that clean air doesn't need to be expensive. More about us. Meet our team in person: We're in China, India, Mongolia and the Philippines.